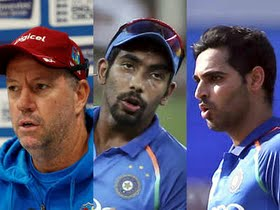 West Indies coach Stuart Law feels his batsmen’s great showing in the first two ODIs has forced the Indian team management to recall regulars Bhuvneshwar Kumar and Jasprit Bumrah for final three ODIs. India conceded over 320 in both the ODIs, with both Umesh Yadav and Mohammed Shami going for plenty. "That's probably the reason (our batting) why they've (India) called back their two most experienced one-day bowlers. To our credit, we haven't shied away from it," Law was quoted as saying in a PTI report. Even as India’s bowling is failing, Virat Kohli has continued to be exceptional. Law though feels he is bound to fail. "How do you get Virat out? He gave us chance at 40. He is a wonderful player. I just love the way he goes about compiling an innings. Looks like he is working very hard but he's doing it very easy. So we do have plans to him,” added the Windies coach in the PTI report. West Indies stayed alive in the series with a tie in the second ODI, thanks to stupendous knocks from Shimron Hetmyer and Shai Hope.